If you are a Harry Potter fan, surely you recall the scene where Hermione, Ron, and Harry encounter a full-grown mountain troll in a girl’s bathroom. Ultimately, they subdue the troll—but Harry’s wand will never be the same. Trolls may be a welcomed addition to a fantasy novel, but facing one on social media is intimidating. Celebrities routinely deal with everything from stalkers to sensationalists, eager to share in a flash of Internet fame. These are not your everyday mountain trolls. Writers don’t generally wear a bull’s-eye on their back, unless they’ve achieved the status of Chuck Wendig, Stephen King, or J.K. Rowling (72.7K, 3.6 million,11.6 million Twitter followers, respectively). Our current commander-in-chief famously blocked Stephen King in June. Not daunted in the least, J.K. Rowling stepped up to the plate, offering to send screenshots of all “presidential” tweets to King via D.M. Spot-check Chuck Wendig’s Twitter feed, and you’ll notice fascinating interchanges on politics/culture. Wendig uses humor to defuse those who troll his account. Occasionally, he resorts to retweeting the most offensive posts. This strategy proves quite effective in many cases. When a comment is dripping with underlying racism, sexism, or homophobia, writers will come to one another’s rescue and shut that s*%t down fast. Those of us with a moderate following are unlikely to experience that level of vitriol. But if our social media reflects our interests/values, then we’re sure to offend at some point. Even if we kept to writing books and used social media solely as a marketing platform, inevitably, someone would be affronted by something we’d penned. There are times a troll should be called out. Facebook has made it easy to report offensive posts, but Twitter has strides to make. Inflammatory tweets are often tolerated. Some argue that a certain person, who holds the highest office in the land, should have his tweeting privileges rescinded. It’s natural to feel wounded by a brutal criticism or venomous remark. To metaphorically slay your troll, kick-box the snuff out of a heavy bag. Go for a walk. Take a yoga class. Binge watch Netflix with a bowl of popcorn and a friend. Bonus points if you opt to read, as you are exercising self-care while supporting a fellow writer. Despite the pressure on writers to maintain a platform, social media is not for everyone. I know some very talented people who have “opted out” for sanity’s sake. Pay attention to what you’re feeling, and please do what you need to do for yourself. The world needs the words that only you can write. No matter how you choose to handle a troll, it’s best to protect your wand. Troll bogeys are notoriously hard to wash off. How to Handle Trolls on YouTube: "Trolls are Feeling-Eaters"
A Profanity-Laden Guide to Troll Zen: "Every insult that stings is there to teach you something . 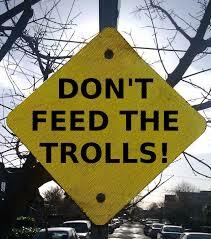 . ."
The Psychology of Trolling: The "Online Disinhibition Effect"
Good advice, Laura! I'm on social media specifically to receive and give information on books and writing, find blog posts and articles of interest, catch breaking news, and to see warm, fuzzy stuff like kittens and puppies. On Facebook, I unfollow everyone who posts mean stuff. On Twitter, I just dump 'em. There are too many really nice folks on social media to waste time with name-callers and trolls.